One of my favorite things about exploring South Carolina was the cypress trees that stood silent and ominous, rising up from the ponds, tufts of Spanish moss caught in their branches. We’d rent canoes at Goodale State Park and paddle to the far end of the lake where there was a trail through the trees. We’d pick our way through, trying not to get lost, ever alert for snakes and alligators. 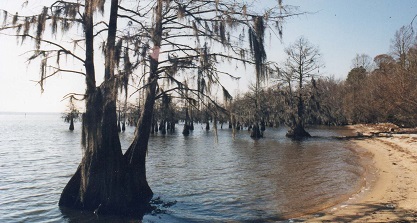 Above is a photo of the shores of Lake Marion, S.C., near the Santee National Wildlife Refuge.